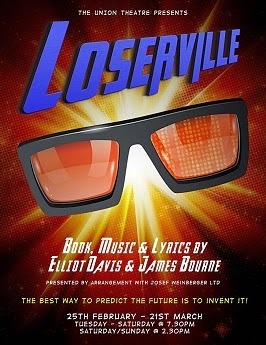 After perhaps a too short run in London’s West End nearly three years ago, Loserville the British musical written by Elliot Davis and James Bourne and inspired by the Son of Dork album ‘Welcome to Loserville’, bursts back on to the fringe scene in a fresh and exciting production at the Union Theatre. Transporting us back to 1971 and the geekishly wonderful life of Michael Dork, the story isn’t massively unfamiliar in its boy meets girl setup. But what Loserville (a Best Musical nominee at the 2013 Oliviers) adds is a wonderful array of period charm, possessing all the right kinds of awkwardness that quickly turn this show into an exciting musical. Instantly greeted by our geeks in the opening number Living In The Future Now, the Union’s strong young cast impresses. Leads Michael Dork (Luke Newton) , Holly Manson (Holly-Ann Hull) and Lucas Lloyd (Jordan Fox) give flawless vocal performances throughout, whilst Lewis Bradley’s ‘arch’ nemesis Eddie Arch proves a hit, giving just enough sinister swagger to make the villain of the piece ultimately too hard to hate. Bradley is equally matched by Sarah Covey in her sophisticated approach as Leia Dawkins. With a strong ensemble, Matt Krzan’s vibrant choreography wonderfully fills the Union’s space, suggesting a brilliant mix of techno drive and high school chic that works extremely well. Bryan Hodgson leads a fine 3 piece band, though there is a slight overpowering in the general mix that occasionally obscures some the ensemble’s fantastic harmonic work. Nothing that cant be fixed, mind. Helming the show, Michael Burgen is by no means a stranger to the Union. Having previously appeared in the theatre’s acclaimed all male ‘Pirates of Penzance’, he jumps ship quite literally to make an impressive directorial debut. 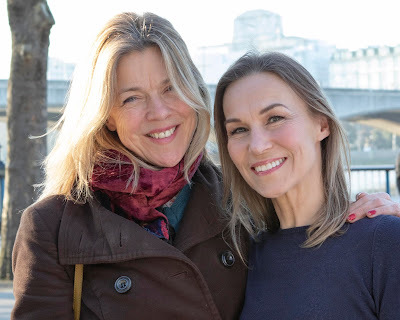 Burgen’s fun, fresh and arguably more home grown approach to the piece, gives it both warmth and heart that the show may have lacked on the bigger stage. Ultimately, its setup of chalk boards, UV paint and VCR props brings out the playful, geekish child in us all and definitely works to the Union’s advantage. Loserville isn’t just for geeks. It has a vulnerability that also packs an impressive musical theatre punch. If you love the songs or even simply just missed the show first time around, then catch it now. Together with Davis, (Mc)Busted’s Bourne has written numbers that speak to the teenager in us all. It’s a fun show driven by a great ensemble.